When we last left Our Plucky Heroine in the tale of My Shamanic Life With Bees, I promised to tell you how the courage I experienced on that day led to The Day My Life Changed Forever and the miraculous changes that ensued. I will keep this promise, but there were some darker and far less flattering moments in between that need to be told as well. On the last date night I had with my former husband (hereafter FH), there was a toxic brew of betrayal and denial bubbling below the surface. Add one potent ingredient and an explosion was inevitable. But also necessary. It was at Irish Fest that I discovered the fermented potion of the Celtic Bee Goddess which legend has it, will cause all who imbibe to speak hidden truths. As I made repeated trips to the honey mead tent, all went well for awhile. FH was surprised and a bit alarmed by my copious consumption of this elixir and my questionable decision to skip dinner, but I had no interest in his opinion. When the bagpipes, electric guitars, and primal drums of the kilted and mohawked Red Hot Chilli Pipers blared, my Irish Celtic Ancestors joined the Bee Goddess to awaken a long slumbering Inner Wild Woman. 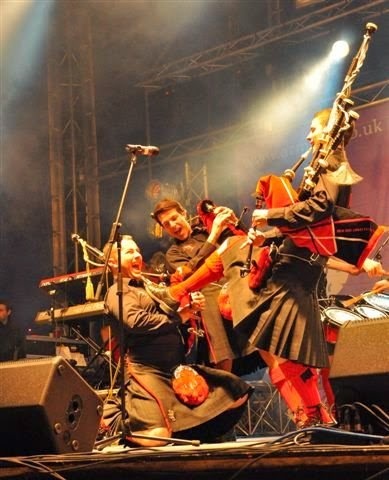 The brooding Norwegians, prim Danes, proper English and all other aspects of my jumbled heritage were trampled (along with everyone between me and the band) as I rushed to the front of the stage to begin dancing in a feral frenzy. FH followed me. He was initially delighted to see this spark of passion from his wife who had been rather boring and reclusive for quite some time. But then, the music was over and I was still on fire. As we were efficiently and abruptly herded, sheep-like with the rest of the drunken revelers out of the festival gates, all of my long suppressed and ignored intuitions combined with buried fury to swarm like angry bees around FH. I morphed into a screaming banshee that my shocked FH had never seen. He had a horror of even mild public displays and this involved a large audience as I loudly insisted that I would not go home with him. To his credit, he did not leave me there and explained to the helpful crowd advocating for me and offering to call the police (which I agreed they should do) that I was in no shape to walk much farther than the curb. He was furious and humiliated as I dramatically milked the performance until he was finally able to get me into the car. It wasn’t until months later that I understood what happened that night. Deep down I knew not just the truth of FH’s affair, but the truth of my authentic self that I could not be in that marriage. I loved FH and he loved me. Neither one of us wanted to acknowledge that we were no longer meant to be together. Whether or not the bees awakened me to the truth and prepared me for what was to come, I can’t say, But they deserve at least partial credit and my eternal gratitude. 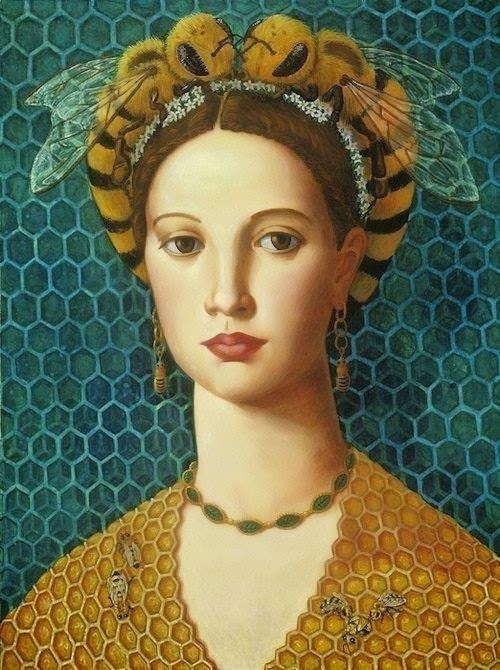 Sara Marpelli – a real life Bee Queen. 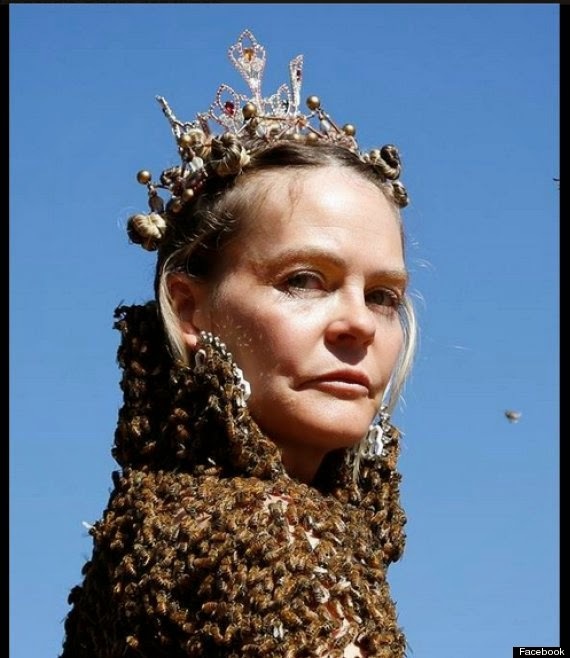 Yes those are real bees covering her! Hanging out with the Bee Goddess/ Inner Wild Woman/Spirit/Intuition (the name is not as essential as trusting the gut feeling) is not usually a comfortable experience. In fact, sometimes it is acutely painful. However, I have discovered that the freedom, joy and delight as well as the miraculous synchronicites that grow each and every time I pay attention and take the risks that this deeper truth advocates, make it well worth whatever price I need to pay. We all have the capacity to tune into the still small voice within or we can wait until the whispers turn into screams. I recommend the former. The day I left FH, (two weeks after The Day My Life Changed Forever, and about a month after this incident), I spontaneously lost all interest in alcohol and have never had more than a rare, polite sip since then. This is no small miracle and only one of many. For those of you who were curious about the many bizarre parallels between my story and the book The Secret Life of Bees, I decided rather than create a separate post, I will just list a few of the major ones in the comments section. I would be delighted if you would leave your comments there as well. You can hide under the cloak of anonymity if you wish. It might be fun to see if I can guess who you are by your comments. I have loved all of your kind emails, but it would be nice to have all feedback in one place. Blogging is new for me and I truly appreciate all of your opinions. As promised, here are a few of the coincidental similarities from "The Secret Life of Bees" (the book that I found the day after my bedroom filled with bees). The story opens with a girl whose bedroom fills with bees. She captures them with a mason jar without getting stung. The month is July and then shortly after her birthday, she leaves home suddenly and unexpectedly due in part to a lie told by the man she lives with (in her case it was her father) with no real plan other than to head for a place called Tiburon (SC). The wonderful family-like community that I found is not in Tiburon SC, but there IS a Tiburon in Marin County CA that is a half hour from where I live. And I even found a Black Madonna there on my first visit. Ooooh... you found a Black Madonna? Probably one of the most powerful affirmations that you are indeed on the right track. Trust all is so much more than merely well my dear friend, you are on the road to yourself. Much love! She was on a prayer flag by the entrance to a labyrinth outside a church. I love the guessing game! Is this Joy? You're just a bee charmer, Idgie Threadgoode. That's what you are, a bee charmer. Hmmm... I will have to eat some Fried Green Tomatoes and see if that activates my intuition, but my first guess is Mary - sister of Joy. I just realized that one drawback of Anonymous is that my reply won't find the sender, but I will just embrace the mystery! I love it that you are so in tune with synchronicities. Life is what we make it,, right? And yours is a joyful, playful adventure! Well I am stumped on who this Anonymous friend is. Too many possible candidates of people who might have said this. But thank you for your great comment, whoever you are! Thanks for adding to the "buzz" around my blog, Lis! I know you know the power of music and movement in dance to awaken intuition!